South Bass Island is one of the most popular and most visited islands in Lake Erie. Its close proximity to the mainland, the plentiful watering holes located on the island make it a highly prized destination. During the season which runs from Memorial Day weekend to Labor Day, the island is active from early morning to late into the night. South Bass Island as it is now referred to has also been called Put-in-Bay Island. The island is 3.5 miles long by 1.5 miles wide and covers 1382 acres. For over a century, South Bass Island has been famous as a summer resort. Ruins of the Victory Hotel, destroyed by fire in 1919, are still evident in the State Park campgrounds. Tourism thrives today making the islands one of the most popular vacation spots in Ohio. The four areas comprising Lake Erie Island state parks were added to the state park system in the early 1950s. 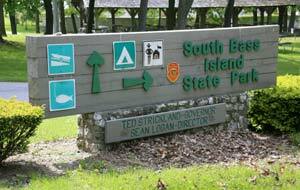 South Bass Island is accessible by ferry from Port Clinton or Catawba Island. From South Bass Island, you can also catch a ferry to North Bass Island. The family campground features 10 full-service camp sites with electric, sewer, and water hookups, 125 non-electric sites, showers, latrines and a dump station. Pet camping is permitted on designated sites. A youth group camp is available by reservation for organized groups. Four cabents, combining the best features of a cabin and tent, are available through a lottery system for weekly rental from Memorial Day to the last weekend in September. A separate lottery is held for rental of the rustic cabin located near the park office. Contact the Catawba Island park office for lottery details. A picnic shelter, picnic areas, launch ramp, fishing pier and small stone beach area are also available. Perry's Cave is one of the oldest attractions on South Bass Island and still a popular tourist stop. The natural limestone cave is some 52' below the surface and is about 50 degrees year round, which can feel great when temperatures are in the 90s on a hot summer afternoon. 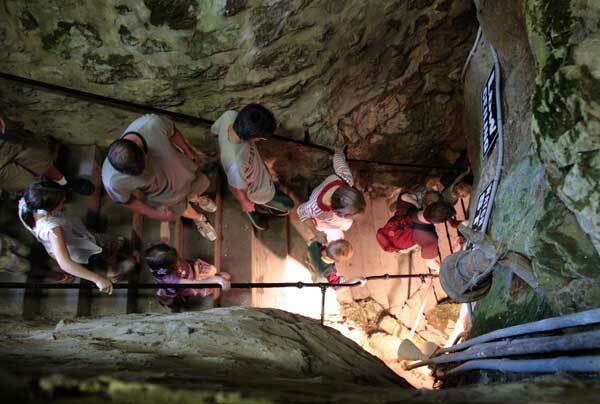 The cave is accessed by some steep stairs that lead to a 208' long and 165' wide room. Most caves in Ohio have some stalagtites and stalagmites. Perrys Cave did have these features, but years ago, early uninformed entrpreneurs broke off these centuries old creations and sold them in the gift store. The underground pool in Perry's Cave rises and falls with the water level in Lake Erie, and although the water is somewhat filtered through the subterranean rocks, it is still lake water and not any safer to drink than drinking water directly from Lake Erie. This wasn't always the case. Native Americans living on the island when Commodore Perry were familiar with the cave and its water. Even during the War of 1812, it was common knowledge that drinking lake water could lead to problems. So when Commodore Perry realized he needed to find a nearby source for fresh water, he for fresh waterWhen the lake was first discovered by Commodore Perry in 1813 some of his men became ill, but they recovered soon after drinking the cold water of the underground lake. Water from the lake also met the needs of guests at the Victory Hotel. 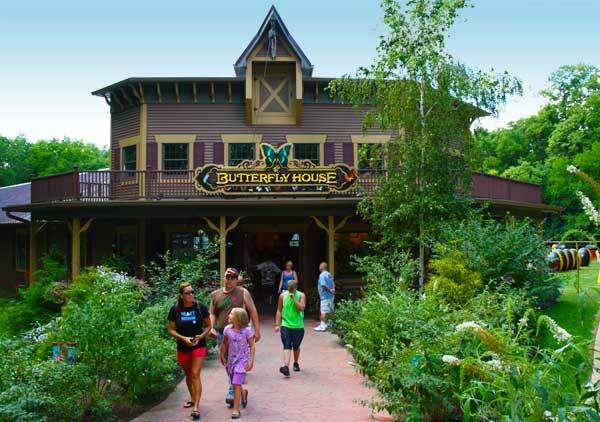 Next door to Perry's Cave is the 4000 square foot Butterfly House which opened in 2004 and houses over 500 different types of exotic butterflies from around the world. Relax with soothing music as butterflies flit about the scented butterfly bushes and other beautiful flowers. Kids will enjoy the secret walkways throughout the garden and to get close to the butterflies in their natural environment. A 15-minute educational presentation is also included at no extra charge and you can stay as long as want. The Aquatic Resources Visitor Center is a great spot to entertain the kids, and it's also FREE. Operated by the Ohio Department of Natural Resources, the center offers hands-on displays, provides free fishing gear, bait and tackle for the kids to learn to fish. Open Tuesday - Saturday 10 - 5. Anglers 16 and older must have a valid Ohio fishing license. 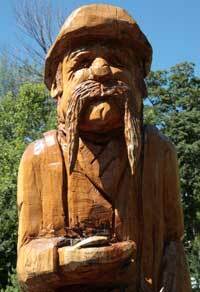 The entire family can enjoy fishing from the center's large dock overlooking Put-In-Bay harbor. Fish most often caught include yellow perch, sunfish, rock bass, smallmouth bass, and even some largemouth bass. Benches and a small picnic area are provided, and courtesy docking is available for boaters visiting the center. 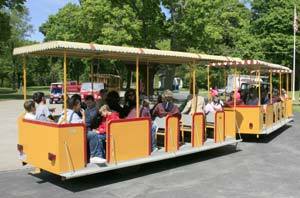 The center is located at 1 Peach Point Road, approximately one mile west of downtown Put-in-Bay. 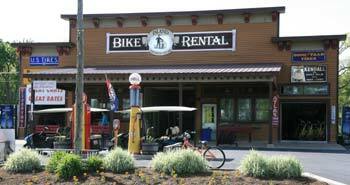 Bike rentals and golf cart rentals are available at a number of locations throughout the island. The island is fairly flat and even if you haven't rode a bicycle in years, you should be able to get around and see the major attractions away from Put-in-Bay on a bicycle. Don't feel like putting out that much effort? Then consider taking the train. There is a very informative narrated ride on the island tour train. The tour lasts about 1 hour and makes numerous stops along the way so you'll get a good idea of what's available and what you might like to go back and see again. Perry's Victory Monument is the most distinctive feature of South Bass Island. Depending on the renovation schedule, you might even be able to take the elevator to the top of the monument. There is also a worthwhile visitor center not far from the monument that is free. 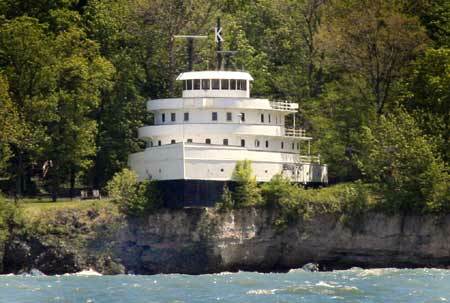 As you depart from Put-in-Bay Harbor, on the west side of the island, you might notice what looks like a grounded lake freighter sitting atop the cliffs of the island. It is in fact the Benson Ford, once the flagship of the Ford Motor Company's fleet of Great Lake freighters. It was named after one Henry Fords grandsons. It saw service for more than 50 years, yet in 1986, its usefulness had come to an end and the next port for the big freighter was to be the scrap yard. About the same time, Frank and Lydia Sullivan were island hopping and looking for a summer home. That was when Frank heard about the big freighter being scrapped and when he started thinking big. What if they could cut off the front of the ship that housed the walnut-paneled staterooms, fireplace and special kitchen that Henry Ford had installed in his flagship. After much expense and problems, the front end of the ship was removed and loaded on a large barge in Cleveland and shipped the 60 miles to its current resting spot. It took a number of lifting cranes to jockey the structure into place. The bow of the ship sticks out over the cliff. The unusual home was sold in 1999 for a reported price of $451,000. On the west side of the Perry Victory Monument is an excellent visitor center that provides some great information not only on Perry's Victory over the British on Lake Erie during the War of 1812, but also on the war itself and how the closure of that war made the United States and Great Britain friends. The visitor center is free, offers a video presentation and gift store.